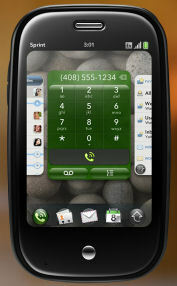 The unveiling of the Palm Pre phone at CES in January 2009 was big news, for good reason -- It's an interesting combination of new ideas in the design of a connected PDA phone (www.palm.com/us/products/phones/pre). The Pre includes several interesting new refinements for a connected portable PDA / phone, based on a clear design approach that holds a lot of promise if it can deliver the full product. In particular, the Pre's interface is designed to make it easy to move between multiple activities. And its core applications are designed to understand and manage information from multiple sources, including desktop (Outlook) and online (Google, Facebook). The current PDA phone market starts with the Apple iPhone, with the clear Apple design aesthetic, and a strong focus on media playback through desktop syncing with iTunes (although online is becoming more important). Then there's the BackBerry, and the touch-screen BlackBerry Storm from Verizon Wireless. The core design of the BlackBerry platform is clearly rooted in business and enterprise use for messaging, although it has extended with more general support for media, Web, and GPS navigation, and then to touchscreens. Then came the T-Mobile G1 / Google Android phone, with a very different design focus -- not desktop media, not enterprise, but instead rooted in the Internet cloud itself. The G1 is for people who manage their lives with the online Google apps, access them on the fly from various computers (as on a business site or college campus), and now want to sync and access via a portable device. Meanwhile, Widows Mobile brings the Windows approach to phones, complete with mini versions of the Office applications and even a task manager. And while some licensees have designed friendlier user interfaces front ends for their phones, you still eventually end up dropping into the Windows-derived environment. The Palm Pre has a shot at fitting the open area in the market between these alternatives. It's not just for work, or just for play. And it addresses several core issues from the original Palm systems that now frustrate users -- the difficulty in switching quickly between different activities, and the difficulty in managing our multiple electronic lives. The Pre keyboard drops down in portrait orientation, so the keys are more tightly packed than the G1's landscape keyboard. When you're done texting and checking e-mail, however, the Pre also can be used rotated in landscape mode for widescreen viewing of websites and playing media. Having a keyboard also allows the Pre to provide a handy Universal search feature. Just start typing a name to search contacts and applications, with the search results refined instantly as you type more letters. But if the search terms gets longer and there are no local matches, the Pre then offers to search online at sources including Google and Wikipedia. The Pre comes with 8 GB of built-in memory, but there's no card slot for adding additional storage. It does have a rechargeable, removable battery. Other features include a 3 MP camera -- with LED flash (but not for video capture or voice recording), ambient light sensor (to dim the display), accelerometer, and proximity sensor (to turn off the display when near your face). The Pre supports high-speed 3G EVDO Rev A mobile networks, plus Wi-Fi 802.11b/g wireless. And it has built-in GPS to look up directions or nearby points of interest. From the early Palms, PDAs were designed to focus on doing one thing at a time. But as PDAs evolved to connected smartphones, they need to be much more flexible -- so you can switching quickly from e-mail and back to update a memo, or jump between web browsing and updating a calendar entry. But current interfaces require that you go back to the main launcher screen, start up the second application, do your work, then go back to the launcher, then start up the first app again. This is slow and clumsy compared to how we are used to hopping between open windows on a PC. But a windows interface obviously would not work well on a PDA screen. The Pre interface uses a "card" model which allows you to switch easily between multiple activities. At any point you can reduce the size of the current screen to view it as one of a row of current activities. To help organize your work, can simply flip through the cards to organize them and skip between activities. Then when you're done, simply flip the associated card off the screen. Another result of the old model of one task at a time on older devices is that notifications of events like a calendar alarm or an incoming text message are incredibly disruptive, as the work that you were doing suddenly is covered over by a modal message that you need to deal with before you can do anything else. Instead, the Pre is designed with unobtrusive notifications, which are displayed in a Notifications dashboard at the bottom of the screen, so they can present information without interrupting your current work. 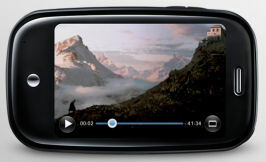 The Pre uses single-finger and multi-touch gestures to navigate and control the display, including zoom and copy & paste. The area below the screen is active for gesture controls, including popping up a quick launch bar at the bottom of the screen. The other way that we've outgrown the early PDAs is in the complexity of our interconnections with others. We no longer have one calendar or one contact list -- and we have multiple personalities, or at least multiple instances of our lives stored and shared in different sources, including Outlook (personal and business), the Google cloud, and social networking sites like Facebook. The result in conventional contact managers is that we have duplicate, sometimes overlapping instances of the same person, business and personal, or for different affiliations. And with conventional calendars, we end up doing manual updates to try to keep at least important events in sync. Plus, we can lose track of a conversational thread as it migrates across different contact addresses, and between e-mail and IM and text messaging. For example, the T-Mobile G1 phone is registered to a specific Google account so it can sync your information from the cloud (contacts, calendar) -- but it's not designed to support the idea that people have multiple e-mail addresses for different parts of their lives. The Pre Synergy feature is designed from the ground up to integrate information from multiple sources, as applications communicate dynamically to the web. 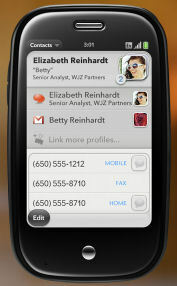 - The Contacts list links to contact information from different sources, without duplicate entries. And it can pull a photo of the contact from Facebook. Contacts than serves as a hub for all types of communications across these different sources. - The Calendar presents one logical view layered calendar from multiple sources. The sources are indicated with different coloring, and can be hidden to isolate on a specific calendar. - E-mail presents a combined view from all your accounts, including Outlook or personal accounts like Gmail, AOL, and Yahoo! You then can choose the account to use when sending a message. - Messaging displays a combined threaded conversation with the same person in one chat-style view, including different IM services and/or text and multimedia messages. You can check if a person is online from Contacts, and then start a new conversation with one touch. Outlook or personal accounts like Gmail, AOL, and Yahoo! 1/09 - Computing Unplugged - Should die-hard Palm users consider a Pre?